Microsoft Outlook stores emails and other mailbox items in a file named PST or Personal Storage Table. PST file is stored locally on users’ system. There are two kinds of PST file namely ANSI and UNICODE. Outlook 2002 and earlier versions use ANSI PST file which has size limit of 2GB. Once PST file exceeds this limit it become inaccessible and corrupt. The same issue comes with ANSI files (used in Outlook 2003 and later version) file when it reaches 50 GB. In this article i will let you know how to split pst file safely. Once the PST file gets corrupted it gets inaccessible and user is not able to access his emails. You can avoid this situation by splitting the PST file into multiple PST files. You can also compress the PST file to reduce the size of PST file. Outlook doesn’t provide any tool or function to split the PST file but you can perform this by using “Import and Export” method or “Archive” method. There is another feature called “Move to Folder” which moves some content of PST file to another folder thus reducing the size of PST file. Click File Select Cleanup Tools. Now Select Archivefrom the list. The dialog box“Archive”will appear. The box “Archive this folder and all subfolders” is checked by default. If it is not, then check it. Now select any folder from the list that you want to move. An option“Archive items older than”is shown there. Select a date from the calendar. ClickBrowse. Select the location and save new PST file. Click File> Select Account Settings. Once “Account Settings”dialog box is open. Click Data Files tab and Click Add. Another dialog box “Create or Open Outlook Data File”will appear. Select the location for new PST file. Now ClickFile Click Open and select Import. A dialog box “Import and Export Wizard” will be open . Choose Export to a fileand click Next. 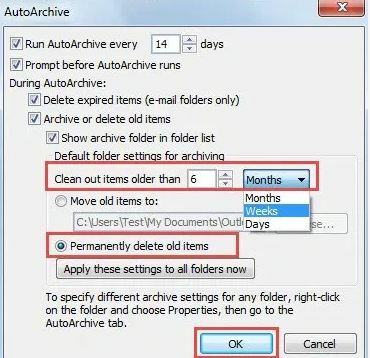 Choose Outlook Data File (.pst)and click Next. Now select the folder to export from. Expand the folder and select any item. Then clickNext. A new window “Create Outlook Data File”will pop up. You may apply password and protect the file. Or if you do not want this, simply click on Cancel. Click File> New > Outlook Data File. A dialog box “New Outlook Data File”will appear. Select Office Outlook Personal Folder File (.pst) and click OK.
A new dialog box“Create Microsoft Personal Folders”will pop up. Type a display name for this new PST file. Now select the folder that you want to move to the new PST file. You may move one or more items to new PST file. In theEdit menu, click on Move to Folder. A new dialog box “Move Items”will appear. Click New. Click New PST file under the “Select where to place the folder” Click OK. In the “Move Items”make sure that the new folder in the new PST file is selected. Click OK.